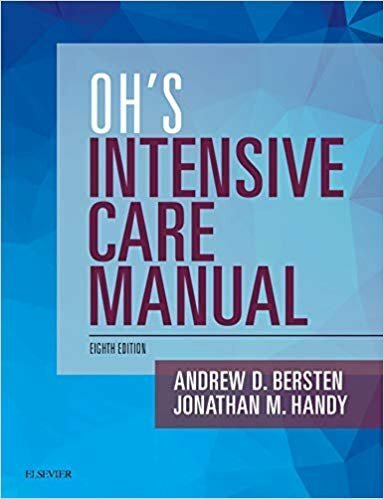 For nearly 40 years, Oh's Intensive Care Manual has been the quick reference of choice for ICU physicians at all levels of experience. The revised 8th edition maintains this tradition of excellence, providing fast access to practical information needed every day in today's intensive care unit. This bestselling manual covers all aspects of intensive care in sufficient detail for daily practice while keeping you up to date with the latest innovations in the field. New coverage of the latest developments in ICU imaging techniques, including ultrasound. New information on the latest advances in ECMO (Extracorporeal Membrane Oxygenation) for cardiac and respiratory failure, ARDS, septic shock, neurologic disorders, muscle function, and hemodynamic therapy. New co-editor Dr. Jonathan Handy shares his knowledge and expertise on acid-base disturbances during critical illness, critical care transfers, intravenous fluid therapy, cardiovascular physiology, burn management, sepsis, and the immunological impact of surgery and burn injury. Expert ConsultT eBook version included with purchase. This enhanced eBook experience allows you to search all of the text, figures, and references from the book on a variety of devices.